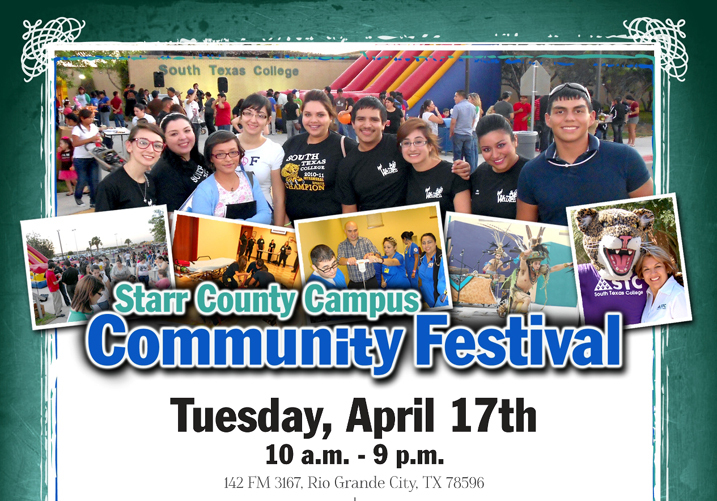 All community members are invited to South Texas College’s Starr County Campus Community Festival on Tuesday, April 17, 2012. Activities are scheduled throughout the day from 10 a.m. to 9 p.m. at the campus located at 142 FM 3167 in Rio Grande City. Admission is free and open to community members of all ages. “The purpose of the festival is to thank the community for its steadfast support for South Texas College and the Starr County Campus,” said Starr County Campus Coordinator Ruben Saenz. At 10:30 a.m., students and community members are encouraged to meet and visit with Dr. Shirley A. Reed, STC president. She will be on hand at the Student Activities Building to greet attendees. From 10 a.m. to 2 p.m., students from the college’s Nursing and Allied Health Division will provide attendees free blood pressure and heart rate screenings, as well as body mass and weight measurements. STC’s Emergency Medical Technology Program will display a medical emergency evacuation helicopter. At noon, the campus library will show, “Puss in Boots” and provide free refreshments, and sign community members up for library cards. Also at 1, 2, 3 and 4 p.m., campus tours are available. From 2 to 5 p.m., the South Texas Literacy Coalition will be at the campus library passing out free children’s books to the first 200 participating children. STLC will also have story tellers on hand to read to children. Especially for children from 4 to 9 p.m., the event includes a scavenger hunt and prizes through STC’s Junior Jaguars Program, carnival games and rides, a planetarium, a photo booth and pictures with college mascot Jerry the Jaguar. From 4 to 9 p.m., general activities include a car show, Native American exhibits and scheduled performances of Pre-Columbian music and dance team Huehuetl at 5:30 p.m., mariachi performances at 6:30 p.m., a show by the STC Folkloric Dance Troupe at 7:15 p.m. and Native American Indian dancers at 8 p.m.
For more information about locations or times of activities visit http://www.southtexascollege.edu/starrcounty.